One school friend thought that I had been dead for ages until he came across my website. Another e-mailed me: are you still alive? If your memory is intact I can tell you who I am. There are people living in this world, you can talk to them, write to them, meet with them, be angry with them and even fight them. ‘Road running’ is good, but not enough. Anyway some of us are still alive [I think]; you could communicate with us; you do not need a license or governmental authority to do that. If you are still capable of reading and writing, let us know how you are. On the evening of 28 June, I read this e-mail in a Gasthof of a small Austrian town on the river Danube just across the border from Germany. Being away from my computer is a drawback of traveling.Two days earlier Karin and I had been cycling in southern Bavaria and visited the renowned fairytaleNeuschwanstein castle. It is not the most beautiful, but attracts thousands of tourists daily, especially from the Far East. With the other sightseers we went to the nearby Marienbruecke, a steel bridge over the Pollat Gorge that offers the best view of the castle. July was hot. Biking was less taxing than running half-marathons. Stacking the two bikes inside my little Honda Jazz, Karin navigated us to Neuschwanstein. She loves doing things the difficult way. She chose an excellent B&B a few kilometres outside Schwangau village. In the evening we biked to the village and reserved places in an early morning group to visit the castle. It was still sunny. My companion, a good amateur photographer, decided that we should bike around the Alpensee located to the west. From the half-way point we got a spectacular view of the two castles, the other being Hohenschwangau gilded by the setting sun and mirrored in the lake (see photo). I shall not talk about the two castles or their eccentric builder Ludwig since they are exquisitely described in Internet. As for my adventure, the cycling track ends at the viewpoint. Karin mademe push or carry my bike for nearly three kilometres over tree roots and rocks: a good preparation for the days to come. Next morning our gracious landlady, Paula, who knew we were going to bike many kilometres around the larger lake, Forggensee, read our minds and gave us two plastic bags for our lunchtime sandwiches. In the name of Paula we squeezed packed lunches into our banana bags for the next ten days; even though in some places a notice indicated clearly that all food must be consumed inside, implying that nothing should be stolen from the breakfast buffet! Karin insisted: why take a bus or a horse-drawn carriage when we have bikes? Going up some two hundred metres to the castle tested my legs and lungs. We left the car in Passau (Germany), which stands at the confluence of three rivers: Danube, Inn and Ilz. Using public transport we explored the old town and dined at a popular restaurant overlooking the Inn. Before 9h00 next morning we put our two bags near the front door of the hotel for the tour company to convey to the next stop, but we never met the agent responsible. 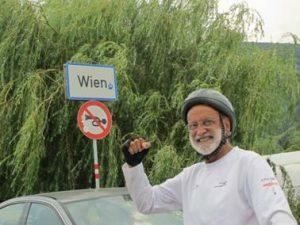 We set off biking along the left bank of the Danube, destination Vienna, some 350km away (see map above). After passing many joggers in the parks and woods we reached the towpath formerly used by teams of horses towing barges upstream. I quickly realized that on a flat track I would have to pedal continuously, no time to rest. Riverbank trees shaded us most of the time in over 34°C temperatures. The beautiful scenery and frequent distraction by long barges kept my mind off fatigue though thighs felt like lead. On reaching the next night stop, cold beer served by pretty waitresses dressed in traditional Austrian costumes was exhilarative. The famous Schlogen bend from high on the hillside was a viewpoint (see photo below) not to be missed: it is normally a thirty-minute climb, only we lost our way and wasted nearly an hour and a half, getting completely exhausted. I could not e-mail my travel log because WiFi communication in the Gasthof was not available due to a violent squall preceding a thunderstorm that cut our TV reception: we almost missed the football final, but luckily the storm cleared just before the match began. Next morning, Monday, we encountered fewer bikers; braver ones doing the whole source-to-mouth exploit. Our track was passable though obstructed by fallen trees and other storm debris, but a strong headwind spawned by the storm was inescapable. We opted for a diversion to seek blessings at Maria Taferl, an Austrian equivalent of Lourdes. The three-and a- half-kilometre climb to the Cathedral was so steep that our bikes refused, obstinate as mules; we had to push them two-thirds of the way. The blessing is only earned through suffering! The eight-minute ride down was delightful. We decided to bike on the shadier right (southern) bank to Melk where we visited the famous dazzling monastery, once stupendously rich. Then followed the enjoyable ride through Austria’s famous vineyards as far as Krems, but we were not particularly keen to face the next day the last and longest stretch of about ninety kilometres, first on the left (northern) and then on the right bank, most of the time through picturesque villages until reaching the Vienna city limit. That left some fifteen kilometres to go. To our delight the bike track crossed to the parklands of Danube Island where we stopped to recuperate for the final sprint. We made it to the hotel at 17h10, too tired to e-mail. Of the three days spent sightseeing in Vienna, my most emotional moment was meeting the family of Alex Kiesel, now a retired doctor, who had been a camper in Switzerland back in 1962 where I was a monitor. [Photos by Karin Nyffenegger).